Although there was no rush to be moving this morning after over two months of being up at (or before) 0530 pretty much all of us were at breakfast by the appointed 0700 – Australian Kevin and I had even been waiting for 0700 to arrive thinking that was when breakfast started so we were somewhat surprised to find everyone there and to discover we could have gone earlier! 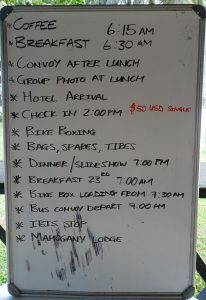 Most of us – riders and crew included – are off to Accra, the capital of Ghana today. 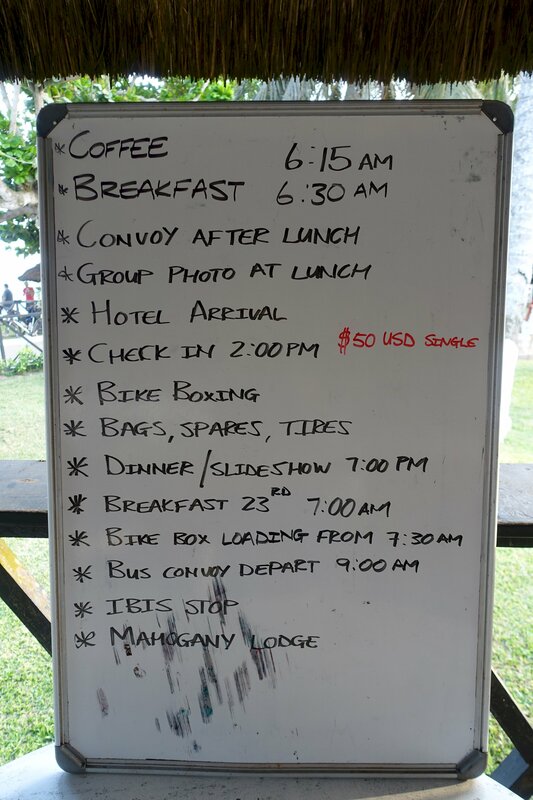 A couple of riders are staying in Cape Coast, as are crew members Sharita and Errol – even though they were two of the first to arrive, their tour isn’t over yet – two of the vehicles are needed early in the new year and it’s up to them to get them where they need to be. The dinner and lunch trucks need to get back to East Africa as soon as possible – ideally they’d be in Cairo by early January but that’s simply not possible. They’re taking today off, but then start retracing our route – all 6,400 km odd of it – and then some to get the trucks back to Tangier, on the ferry to Spain, another ferry to Greece, another to Cairo, and then they start driving again to chase the Tour de Afrique south, hoping to catch them in Sudan in mid February! Once our bikes were on their truck and we were on the bus it was time to go – the two Hiluxes are being shipped from Accra back to Cape Town so they led the convoy for the last time. We stopped for a pee break after two and a half hours, and shortly before 1300 we finally made it to the hotel. For many this was only a short stop with a group of nine riders staying at another hotel for an African Christmas, some going directly on to the airport, and many making use of the facilities at the Ibis before going to the airport later in the day. I’m not leaving till the evening of the 24th so have a room for the night. I spent most of the rest of the afternoon in the lobby of the hotel saying my farewells to people as they took the shuttle or a taxi to the airport. 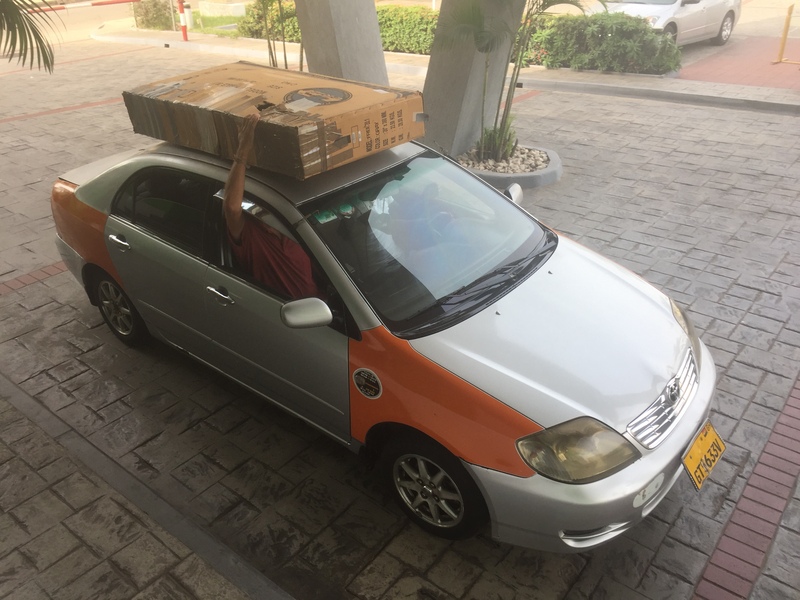 Robert holds his bike box on the roof of his taxi – thankfully the airport is very close, and the traffic is heavy so there will be no high-speed cornering going on! By the second to last day of the tour pretty much everyone was ready to go home but when it actually came time to do so it’s didn’t seem like such a great idea – after so long together, and so many trials and tribulations, there were plenty of tears as farewells were said. Although we came from nineteen different countries, and spanned almost 50 years in age, we really had been one large, generally happy, family for almost three months and the realisation that this group would never all be together again was quite hard to take. By 2030 there were only four of us left – Australian Kevin who leaves tomorrow morning, Mateo who’s staying here tonight (don’t ask ;-), myself (leaving tomorrow evening) and Italo whose flight goes at 0300 tomorrow, so in a ‘path of least resistance’ move we had the buffet dinner at the hotel which for €16 proved to be rather good. So here’s the summary for the entire tour – this is what I did which wasn’t EFI so the total numbers were actually higher than these, though I did ride at least some of every stage even if I didn’t finish two, and didn’t start two until lunch – such are the realities of riding in Africa and pushing so hard. In the end, though it was significantly shorter than the Silk Route, because of the conditions this tour (particularly the later half) ended up being significantly harder on the body. For me the telling difference was the sleep deprivation – the combination of heat, humidity and the constant all-night noise in the second half of the tour really took their toll. Although I was sicker on the Silk Route than I got here, even at my worst there I slept much better than I did here which meant that I was both mentally and physically more able to cope with the demands of each day riding. I thought one of David’s comments was interesting – his view was that (for the full-tour riders particularly) this is much harder on the body than the Tour de France – although they cover their daily distances much quicker than we do (and they do about the same average distance each day) they sleep in air-conditioned comfort, they are constantly monitored by medical teams who ensure optimal nutrition, and they only do it for three weeks, not (almost) three months! Thanks for the terrific read once again Mr Winter. You, are a legend. Good job Steve! Enjoyed reading your blog. Safe journey home just in time for Christmas dinner. Merry Christmas. Are you joining us on the Himalayan Ride?